LUNGevity Foundation, the nation’s leading lung cancer-focused nonprofit, today released a report showcasing its impact on the rapidly advancing field of lung cancer research and patient care. 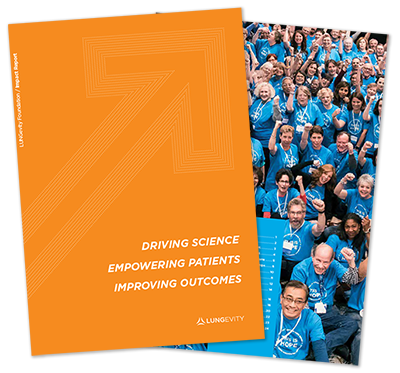 The report demonstrates the impact of LUNGevity on improving outcomes for lung cancer patients through a better understanding of diagnosis, treatment, and quality of life as well as through driving research and policy reforms. More people are now living well with lung cancer than ever before. The report shows the advancements in the Foundation’s research program, patient services, major initiatives, fundraising achievements, marketing reach, and more, and how these accomplishments help drive progress in all areas of the lung cancer field. Issuing this report celebrates breakthroughs in the field of lung cancer while encouraging people to join the organization to fund impactful research, advocate for change, create tools and resources for support and education, and fundraise for progress. LUNGevity is dedicated to fostering an increasingly active lung cancer community—more empowered patients, more long-term survivors, and more living well with lung cancer. Read the full press release. View the 2010-2018 LUNGevity Impact Report.